Affiliate marketing is still a core online marketing technique for many businesses like retail, travel and financial services. The principles of working with and incentivising partners can also be applied to many other areas. To understand how to make affiliate marketing work better from a marketers point-of-view, I've always turned to Geno Prussakov (@ePrussakov), initially through his first book, A practical guide to affiliate marketing and more recently through his latest book from Wiley, [amazon-product text="Affiliate Program Management: An Hour a Day" type="text"]0470651733[/amazon-product] and his excellent AM Navigator blog. He's also founder and chair of Affiliate Management Days conference and a speaker at many other conferences. If its one of your new years resolutions to attend an affiliate conference, check out Geno's guide to affiliate marketing events and conferences in 2012. In our interview we cover the basics of affiliate marketing for those who aren't so familiar with it; ideas on starting or improving a programme; the latest approaches in 2012 including social media, attribution and some other resources you can follow-up with. Q. How do you see the scope of affiliate marketing in 2012? How would you define it for a marketer who isn't familiar with it? Is it just about commission-based payments or does it involve other forms of partnership like contra deals? While contra deal partnerships are really outside the scope of affiliate marketing, your question leads to a very important point -- one of affiliate marketing universality. I personally do not believe affiliate marketing to be a marketing channel or even a type of advertising. It is more appropriate to understand it as a way of structuring your relationship with other marketers, getting them interested to promote you, and being paid on performance basis. It is, therefore (and especially so in 2012), more appropriate to understand affiliate marketing as a special marketing context, the undergirding principle of which is its performance-based remunerating model. The affiliate model works with any type of marketing: display, contextual, video, social media, and other types of advertising, as well as search engine marketing, email marketing, and other methods. The only difference with the pre-affiliate model is that advertisers post-pay and do it for the actions of their choice, as opposed to pre-paying for the actions of the publisher's choice. Q. If a small or startup business is creating an affiliate strategy and programme for the first time what are the 5 most important success factors they should think through? Asking yourself the right strategy questions, and doing it right at the outset -- before, or while creating your affiliate program -- is of utmost importance. In fact, these often predestine success or failure of your affiliate program. 1. What is the primary end consumer action (sale, lead, subscription, etc) that you want to facilitate through affiliates? 2. What types of affiliate marketers will you be most interested in recruiting? 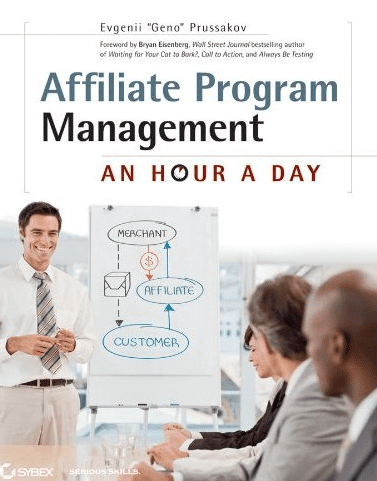 3. Who will manage your affiliate program? 4. What key performance indicators will you be analyzing to measure the performance of your campaign? 5. How will your affiliate program become (and stay) attractive and competitive through commission arrangements and other incentives? Q. How has social media marketing impacted affiliate marketing? At the present time very few marketers really understand how to best use social to generate sales, so the first thing that comes to mind is abundance of "affiliate marketing" spam (both on Facebook and on Twitter). It is unfortunate, but, honestly, quite natural and predictable... The rotten apples, however, shouldn't overshadow those affiliates who truly seek (and do!) to add value through their social media marketing initiates. From social network games to social shopping -- there already are a number of true gems out there. I hope we'll see more of these spring up as affiliate marketers grow in their understanding and appreciation of what the smart use of social media can really accomplish. Those who take their eyes off the hype part of it, and see the amazing tool -- no, not for broadcasting, but for engaging the end consumer in a new and truly useful way -- they are the guys (and gals) who are already making money with it, adding value both for merchants and for consumers. Q. In 2011, there was a lot more focus on using attribution to change how affiliates are remunerated? Which questions should marketers be asking if they are reviewing this issue? Whether we talk about attribution in broader terms, or about splitting affiliate commissions in particular, the bigger questions, in my opinion, are: How do you fairly measure the real value of this or that promotional method that an affiliate may be using? and Can we always reliably know what's in the mind of the consumer at this or that point of interaction with your ad (be it a banner, a text link, or a mention on social media) or brand? Yes, much has changed since the dawn of e-commerce; and the consumer paths to point of checkout have gone from fairly linear ones to a truly multi-touchpoint engagement. So, yes, there definitely is room for multi-click attribution, but should merchants embed this into systems that have affiliate programs in place, it shouldn't done at the expense of lowering the default affiliate conversion, but possibly remunerating other affiliates who were involved in the process in addition to the last one -- be it based on the affiliate types, or the phase of the purchase process that they participated in, or anything else. Incidentally, earlier today Econsultancy announced that House of Fraser has started working with TagMan "to improve its marketing effectiveness" by using their tag management system. It will be interesting to monitor how this goes. Q. Which key trends in affiliate marketing do you think are most important to marketers managing affiliate programmes? I could, of course, (and probably should) talk about the bright future for (and opportunities in) mobile marketing, social, geo-targeting, re-marketing, pay-per-call, and every possible synergy of these; but the trend that I'd particularly like to highlight for affiliate managers is the abundance of high quality educational content that is now being made available -- both online and offline. Just a few years back, there were very few places (ABestWeb in the US, a4u forum in the UK, plus Affiliate Summit and a4uexpo as the conferences to attend on both sides of the Pond) where an affiliate manager could go to get quality information. No surprise why complaints about uneducated affiliate managers were so plentiful. Today things are changing for the better, and at a very promising pace too. By the way, allow me to use this opportunity to also introduce Affiliate Management Days, a new professional forum/conference created specifically for affiliate managers and digital marketing executives who are either looking to learn about, or perfect their, affiliate marketing knowledge. Our first conference will take place on March 8-9 2012 in San Francisco. The agenda is already live on the website; and I'd also like to offer the readers of Smart Insights an exclusive coupon code -- take 15% off registration fee by using SISF15. Keep in mind also that our early bird rate (which saves you additional $300) ends on January 20. Q. What are the 5 best places to learn about affiliate marketing online today? a4u portal — UK-based performance marketing hub, which includes Europe's largest affiliate marketing forum, news, jobs board, and blogs, which I especially recommend checking out. ABestWeb forum — The world's largest affiliate marketing forum with 65,000+ members, and hundreds of thousands of discussions. Affiliate Summit forum and FeedFront magazine — Both of these are Affiliate Summit's initiatives, plenty of useful advice. Affilorama — A New Zealand-based "training and community site for aspiring affiliate marketers." GeekCast.FM podcasts — An aggregation of free online podcasts for (and by) affiliate marketers.